A government source has told Sputnik Arabic that the planes of Saudi-led coalition forces in Yemen have delivered weapons to supporters of Yemeni President Abd Rabbuh Mansur Hadi who are fighting against Houthi rebels in the south of the country. SANAA (Sputnik) – The planes of Saudi-led coalition forces in Yemen have delivered weapons to supporters of Yemeni President Abd Rabbuh Mansur Hadi who are fighting against Houthi rebels in the south of the country, a government source has told Sputnik Arabic. "The coalition led by Saudi Arabia dropped weapons in the Jahaf District in the Ad Dali governorate this morning, as well as in the evening, to support the southern movement against the Houthis and their allies," the source said on Monday. Heavy fighting has been going on in the Jahaf area between the Houthi forces and their opponents, according to the source. Meanwhile the coalition forces have been launching airstrikes on a Houthi-controlled military camp located in the region. A coalition of Arab states led by Saudi Arabia started conducting missile strikes against Houthi rebels in Yemen in late March, following a request for military assistance from Hadi. Yemen's president was forced to resign by the Shiite Houthi group in Januray, when the rebels took control of the capital Sanaa. At the end of March, Hadi left Yemen for Saudi Arabia. 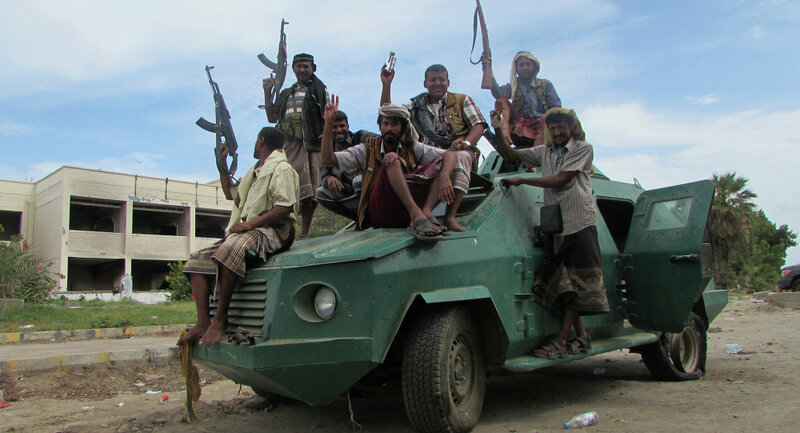 Violent clashes between Houthis and forces loyal to Hadi continue to take place across Yemen. According to UNICEF, over 100,000 people have left their homes in Yemen in search of safer places to stay.